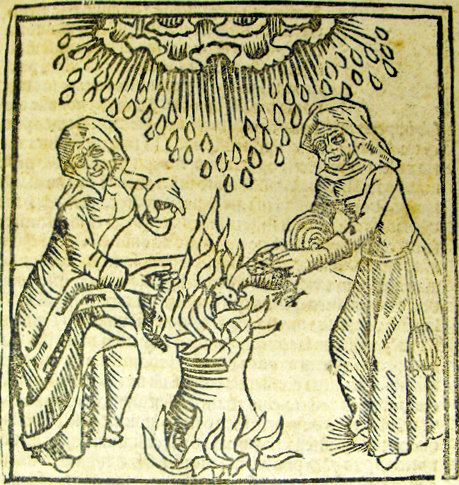 Before I moved to Salem, Halloween was all about ghosts for me, not witches. 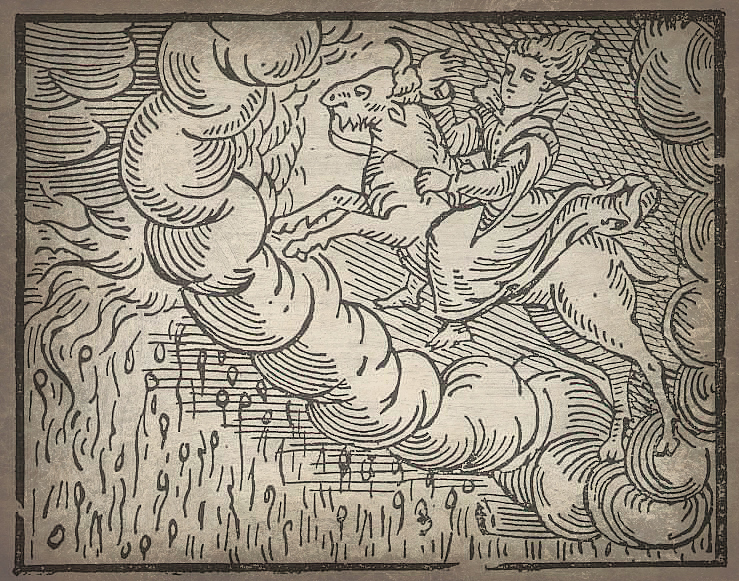 I’m not sure how I became fixated on them as a little girl, but once I grew up I’m sure I made the connection because of the historical origins of Halloween: the eve of All Hallows’ or All Saints’ Day (with earlier pre-Christian foundations), an evening when thoughts were on those who had passed. 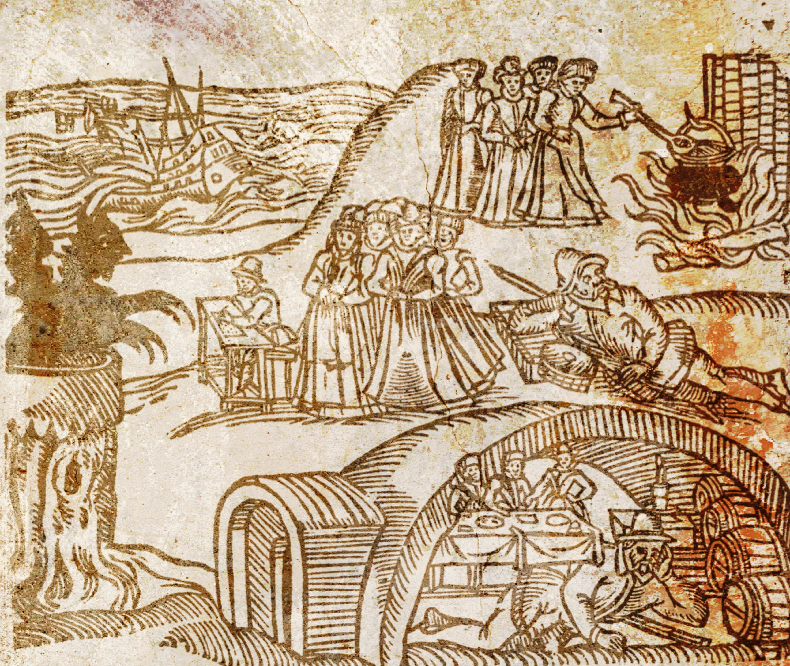 So when I came to Salem and it was all about witches, I was actually a bit confused; I still don’t really grasp the connection between the 1692 Witch Trials and Halloween (besides commerce), but apparently I am the only person in this city who fails to do so. I have fulfilled my Halloween obligations by buying a bucketful of candy which I will hand out tonight, and in the mean time I can celebrate the holiday in my own way: by focusing on ghosts. Some favorite ghosts, starting with my very favorite historical person, Queen Elizabeth I, confronting Napoleon in 1803. The British always call on Elizabeth when they are in trouble. 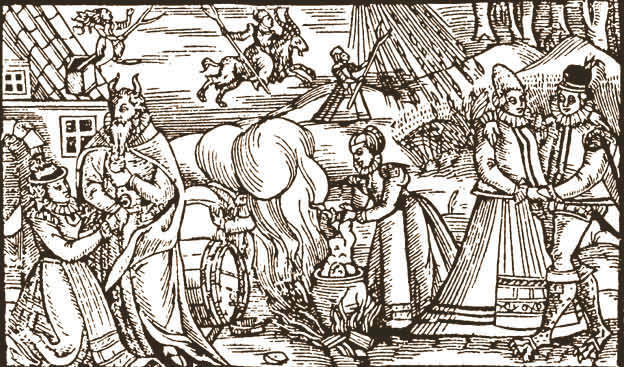 Here she shows him an image of the burning Spanish Armada and proclaims look at that and tremble!!! 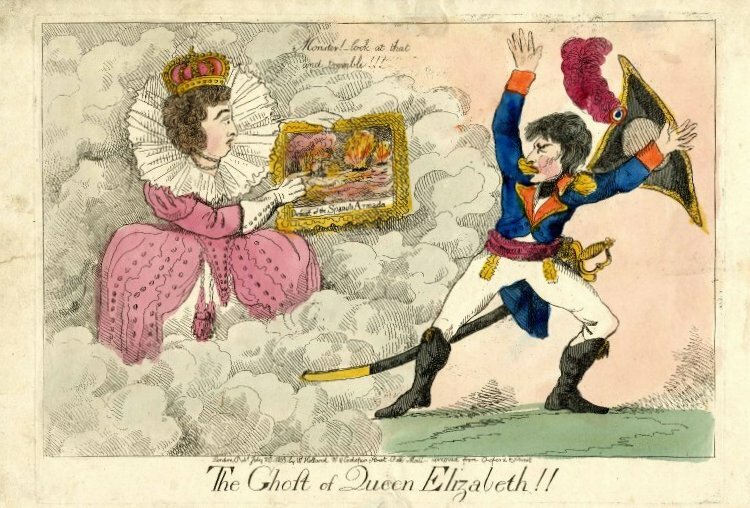 Elizabeth’s ghost is followed by that of another monarch, Louis XVI, protesting Napoleon’s theft of his throne. 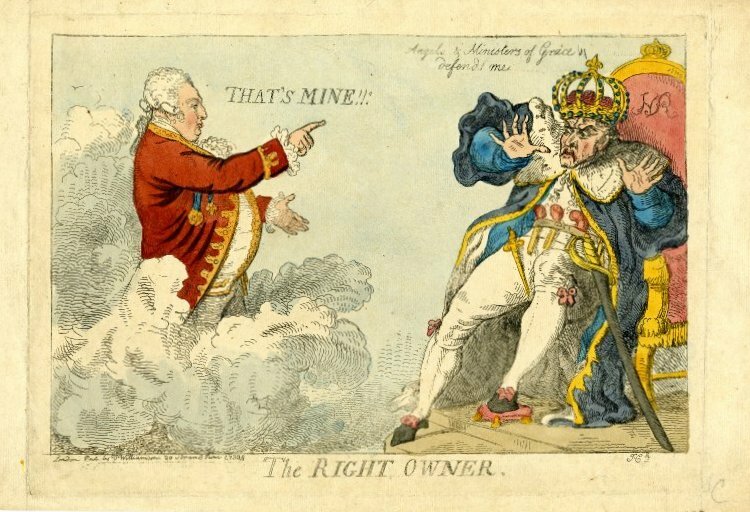 Isaac Cruikshank satirical prints,1803-1804, British Museum, London. 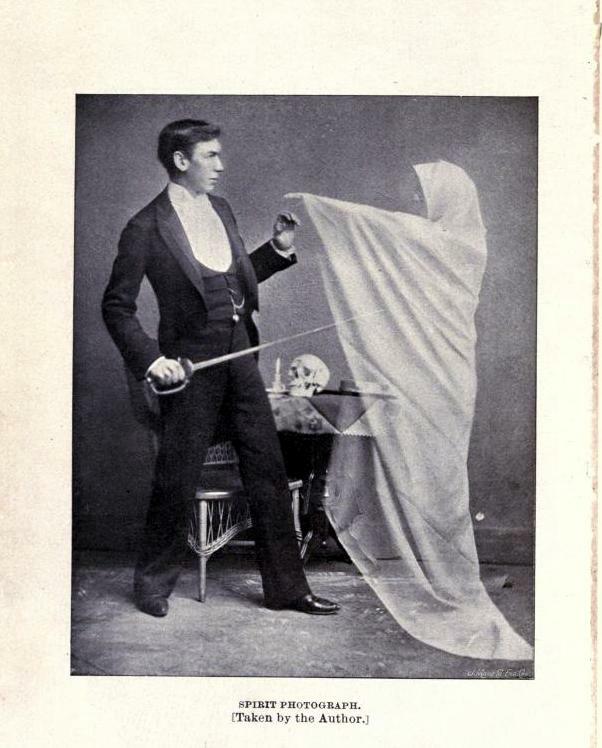 In the later nineteenth century there was a spirited effort to catch ghosts on film, leading to the production of many “spirit photographs” as well as to any equally enthusiastic effort to prove that these images were faked with double exposure and other techniques. For some reason, several spirit photographs feature children, as in the one below, entitled Their Guardian Angel. From the same year, a “staged” photograph by Henry Ridgely Evans (who referred to himself consistently as “Dr.”), an amateur magician who investigated spiritualism at the turn of the last century. 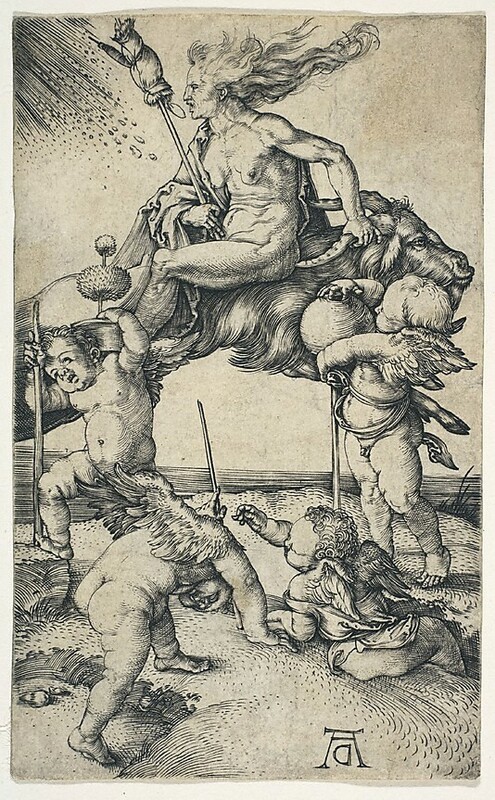 Their Guardian Angel, C.H. Graves, publisher, Victoria & Albert Museum, London; spirit photograph by Henry Ridgley Evans, from his book Hours with the Ghosts or Nineteenth Century Witchcraft: Illustrated Investigations into the Phenomena of Spiritualism and Theosophy (1897). And now for some “ghosts” from the world of art and design. Philippe Starck’s “Ghost” chair is pretty familiar to me, but a more recent discovery is the even more whimsical Ghost Clock of Wendell Castle. The possibilities seem unlimited for ghost furniture. 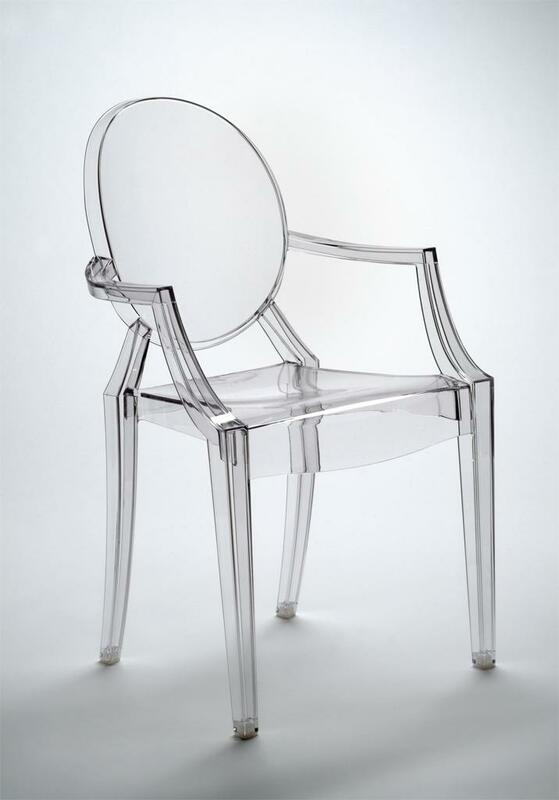 Kartell “Ghost Chair” by Philippe Starck, 2002, Philadelphia Museum of Art; “Ghost Clock” by Wendell Castle, 1985, Smithsonian Museum of American Art. 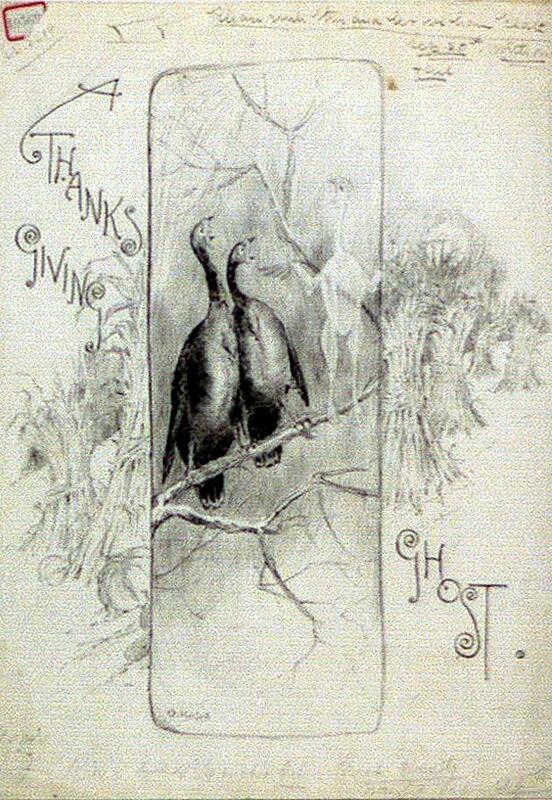 Oliver Herford, A Thanksgiving Ghost, 1885. 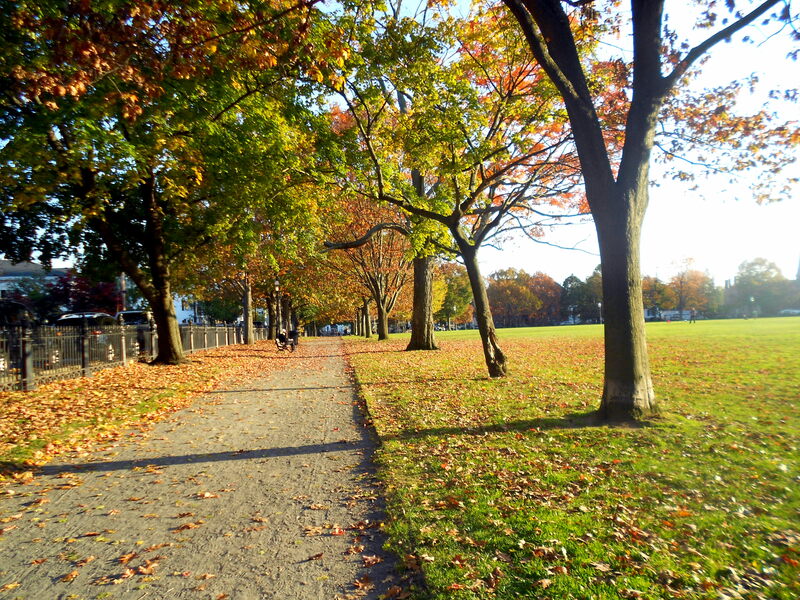 First off, it is Salem Common, not Salem Commons; the Common is not a suburban tract housing development. 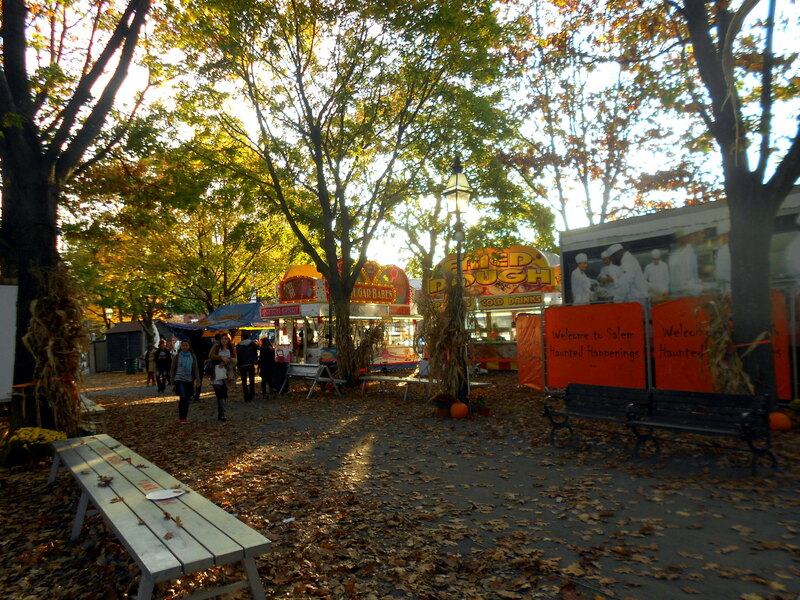 Those who refer to it as “Commons” are either not from Salem, or from New England (where commons are common), or are peddling something, such as the owners of the sausage stands and fried dough trucks who are allowed to set up residence on the Common during October. 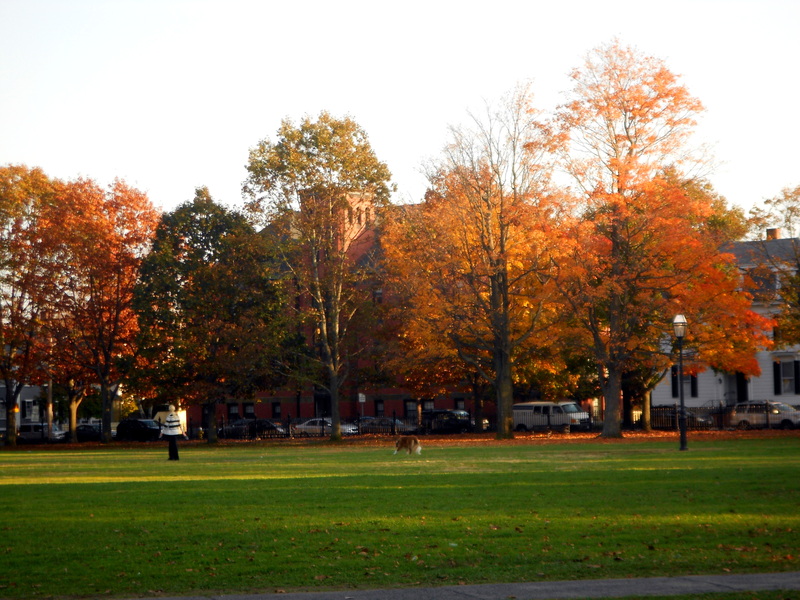 I love commons (I’m using the plural here) and I think Salem has one of the prettiest in New England–but not in October. 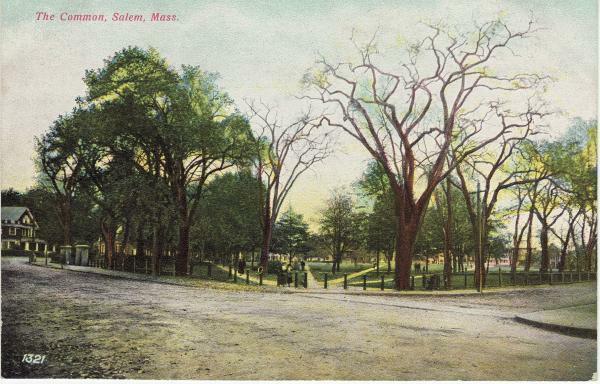 Salem Common this October, and the same corner in an 1870s photograph by Salem photographers Peabody & Tilton (New York Public Library) and a turn-of-the-century postcard. 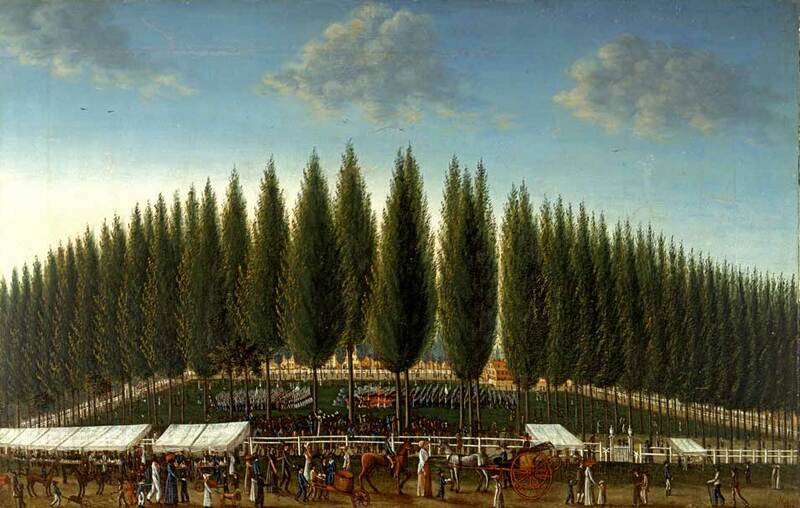 One of my favorite views of the Common is not a photograph, but a painting: George Ropes’ Salem Common on Training Day (1808), which shows the local militia drilling on the green with townspeople looking on: a window into the civic life of the new republic. 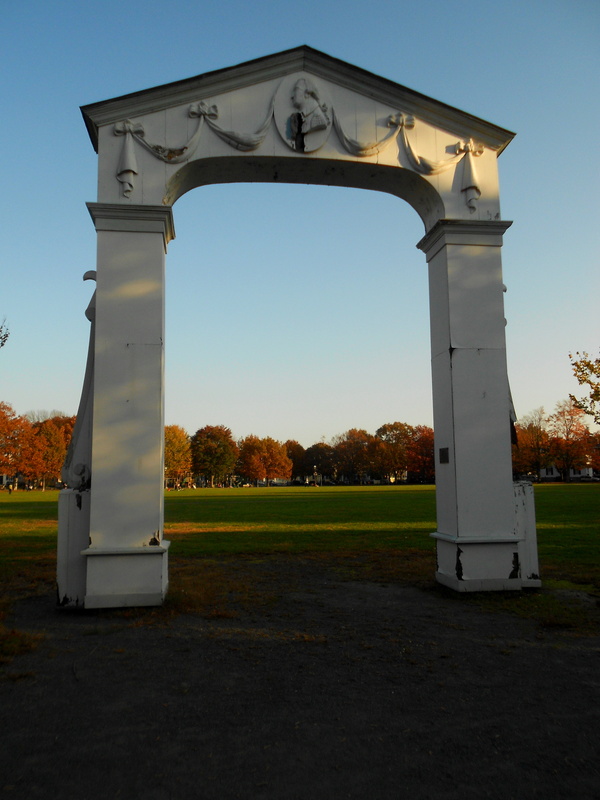 The Common has never been a pristine park but rather the center of varied activities: baseball, weddings, festivals, field days, concerts, ice-skating. 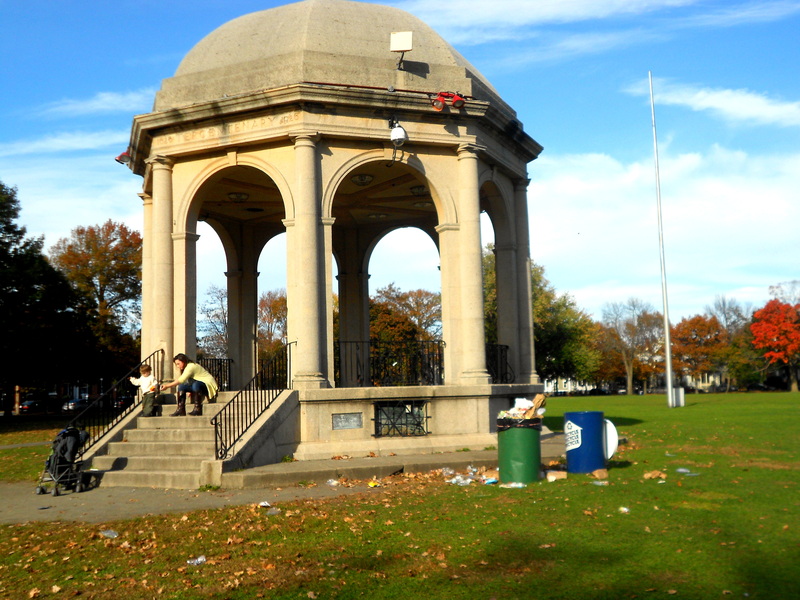 A succession of playgrounds have been located on the Common, and now there’s a particularly nice one on the southeastern corner. I think that most of the activities in the Common’s history, however, have benefited the public rather than private individuals. It is a common, after all. 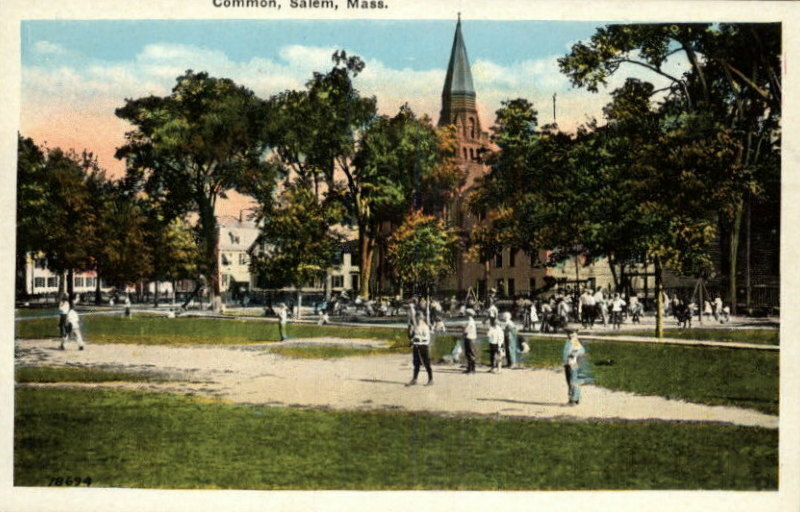 George Ropes, Salem Common on Training Day (1808), Peabody Essex Museum; baseball on the Common in 1910, and the same perspective this past week. 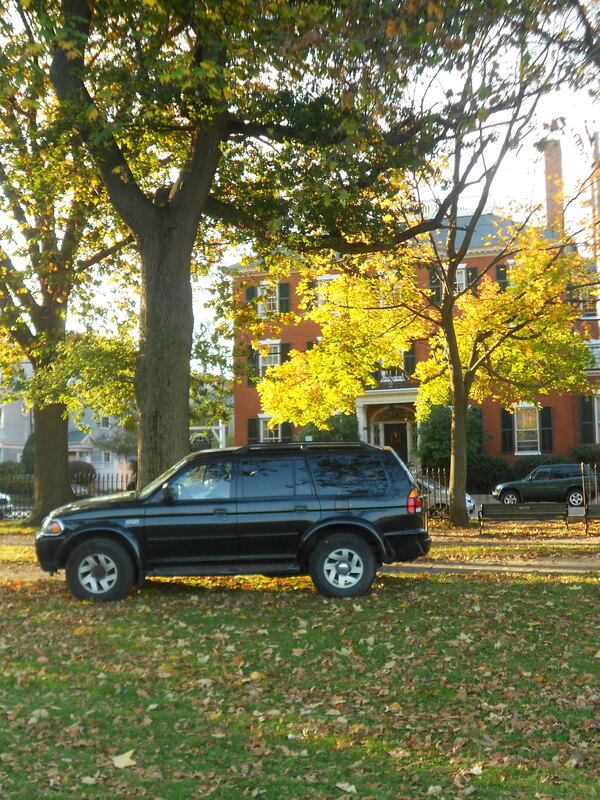 I’ve seen other vehicles besides food trucks drive and park on the Common at this time of year, as if it were a parking lot. 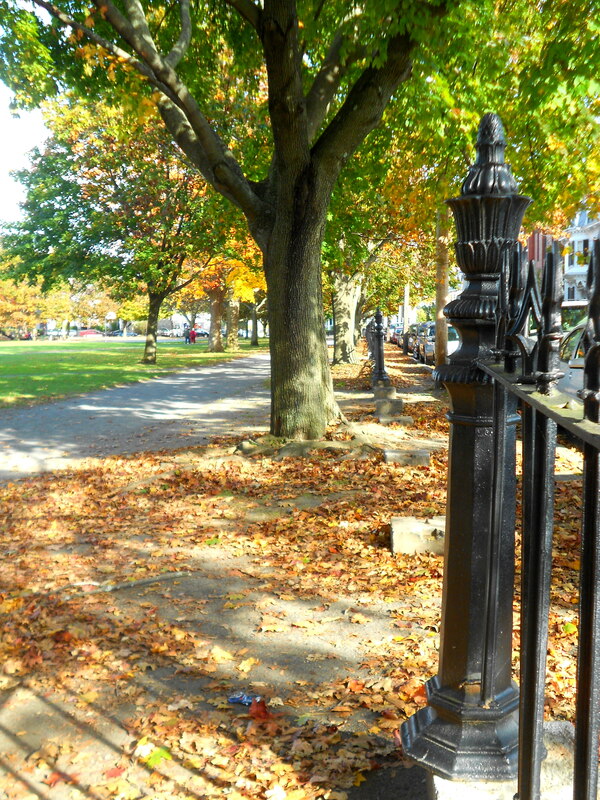 The sense of enclosed, protected, tranquil space in the midst of the city has been challenged for some time now, and not only in October, by the deteriorating condition of the circa 1850 cast iron fence. The city is restoring the fence, in phases, but it’s an expensive undertaking. 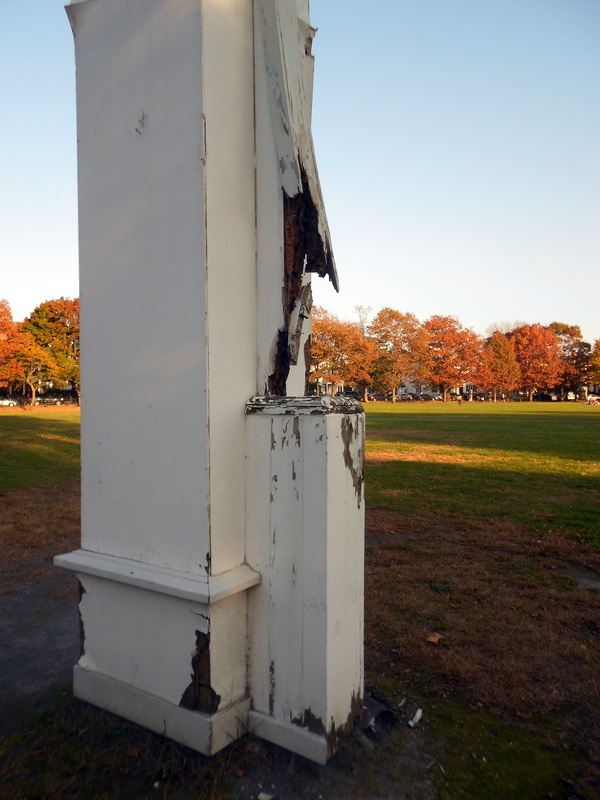 The Washington Arch is looking a little worse for wear too: I’d like to think that the revenues from the food trucks are going towards these repairs in particular, and into a fund for the general maintenance of the Common in general. 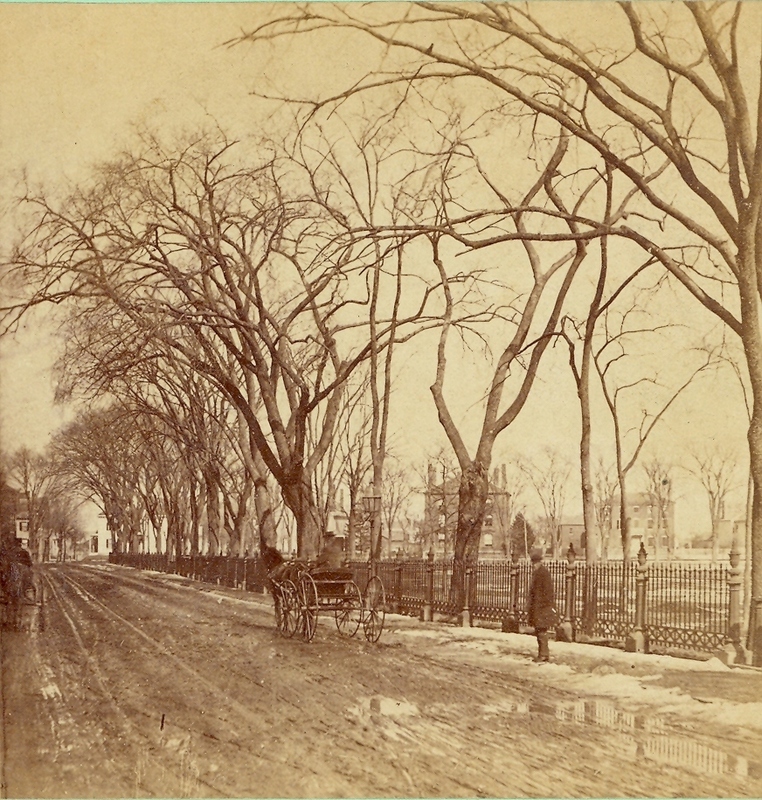 Late nineteenth-century stereoviews show the Common with a more spare and formal look, no doubt, in part to the presence of Elm trees, always so striking in images from the past. Below are three images by the prolific Salem photographers Frank Cousins and G.K. Proctor (I’ve got an interesting post about the latter coming in the next few weeks) and an anonymous contemporary colleague. The north side of the Common remains the most serene today; I imagine that this last photograph is also the last of our Fall color with this enormous storm bearing down on us. 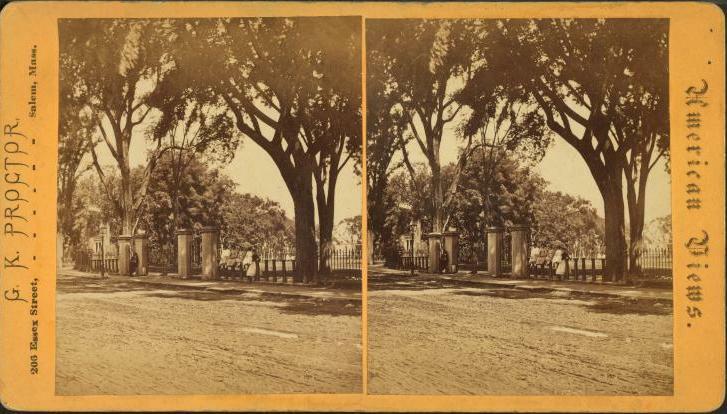 Salem Common stereoviews by Frank Cousins, GK Proctor, and an anonymous photographer, New York Public Library Dennis Collection. 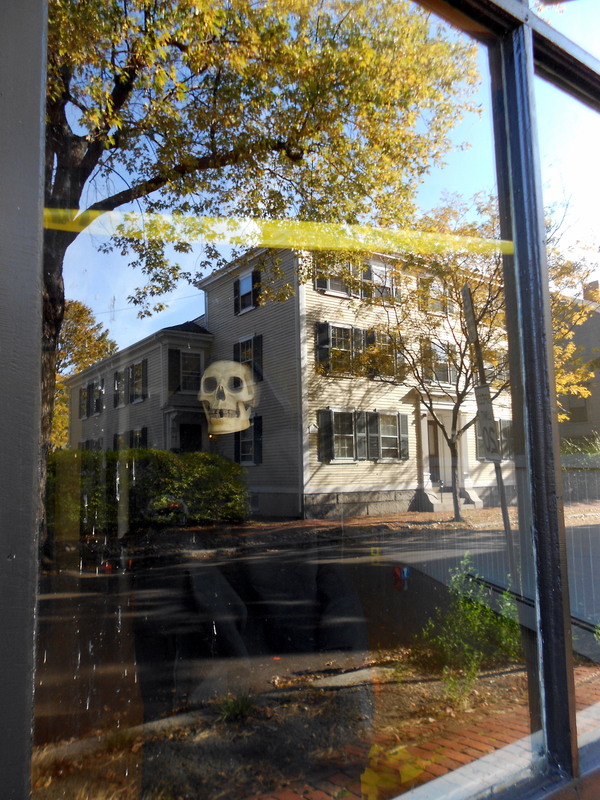 The first picture below sums up Salem at this time of year: a ghoulish figure in a shop window (with yellow crime scene tape) and the reflection of the beautiful Federal house across the street. October is a very vivid month, in more ways than one. 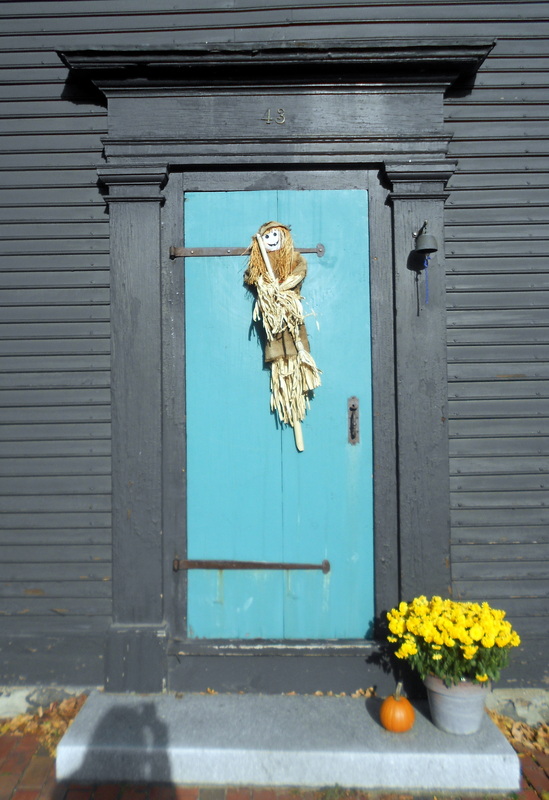 With my general disdain for witchcraft tourism, I tend to focus on the more natural and architectural attributes of our city, but even I can be amused by clever Halloween displays–I like this one, even though it was hard to photograph. 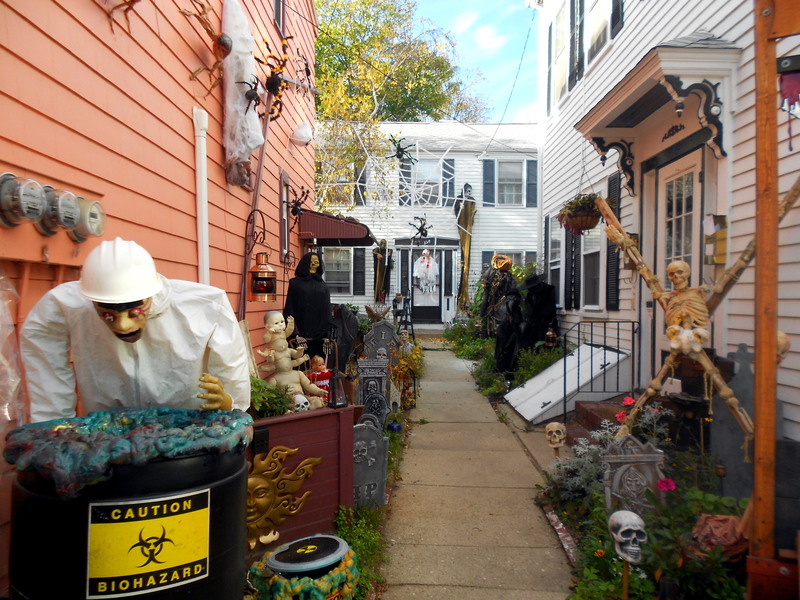 Not quite so subtle, but an easier vignette to capture on film (at least in its entirety) is the annual display in a residential alley off Derby Street: tourists are there all day long in October. 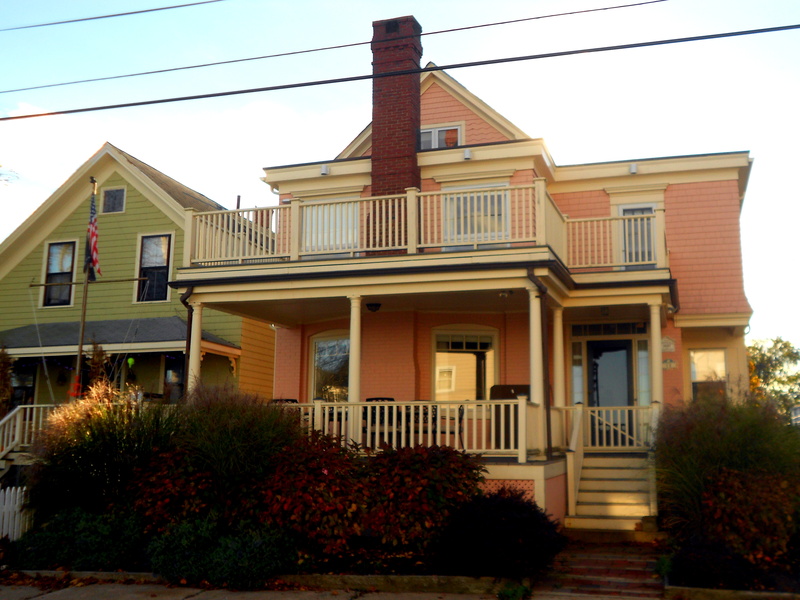 When I was looking for pink houses the other day, I found lots of other colors as well, so this post is much less monochromatic. 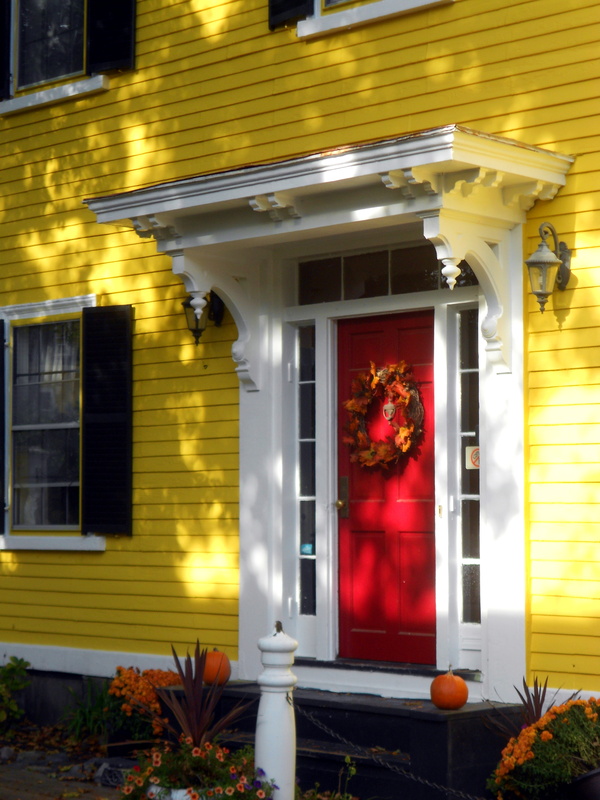 The doors really popped; Salem does not seem to have any of the trendy yellow and chartreuse doors that have been much-featured in shelter magazines in the last few years, but nearly every other color is out there. 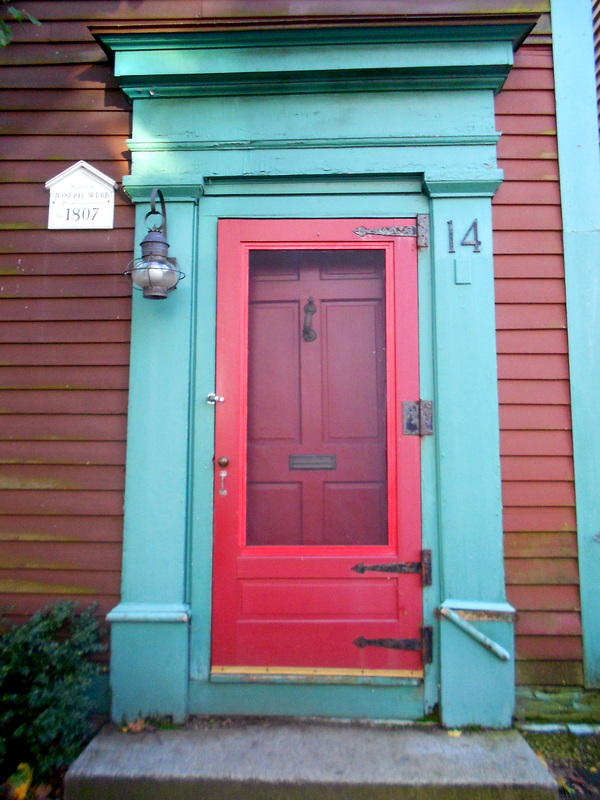 Here are just a few colorful doors, beginning with one of the most photographed entrances in the city, right across from the House of the Seven Gables. 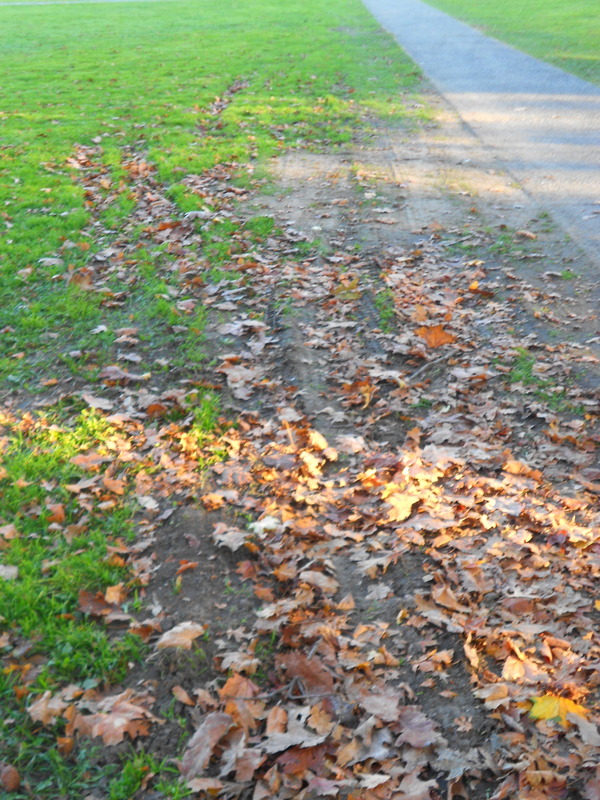 Of course, the turning leaves are also a source of vibrant displays of color at this time of the year. You can’t really tell in a more urban environment, but it seems like the colors are particularly intense this year to me, and the trees are peaking at different times. A case in point is this pair of trees on Essex Street, one completely bare, the other just past peak. 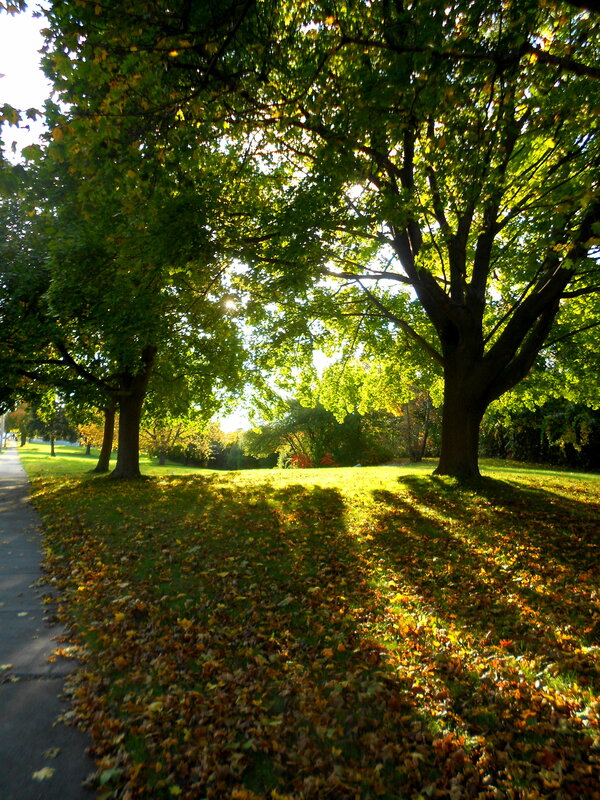 Many tree are still mostly green, quite late in the season. 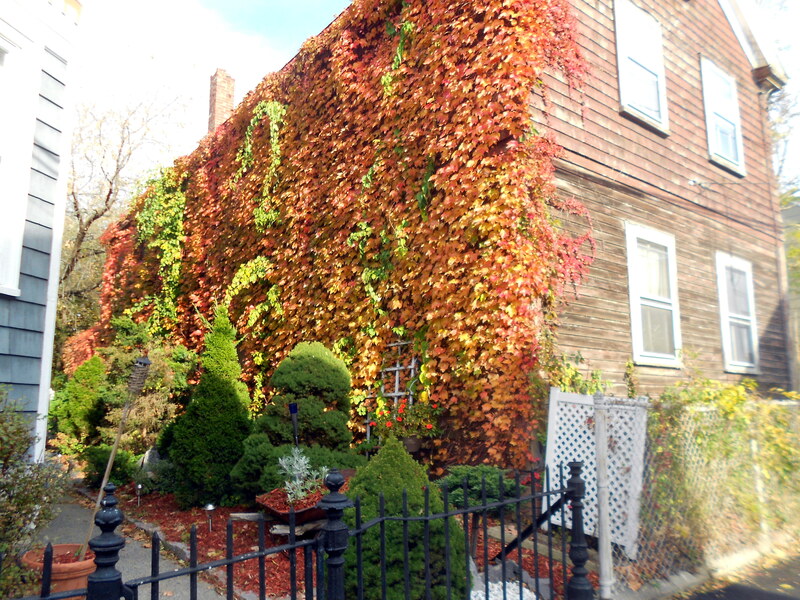 I love the leaves on the back of this weathered house by the water. Now in what other city could you see a whirligig framed against onion domes? 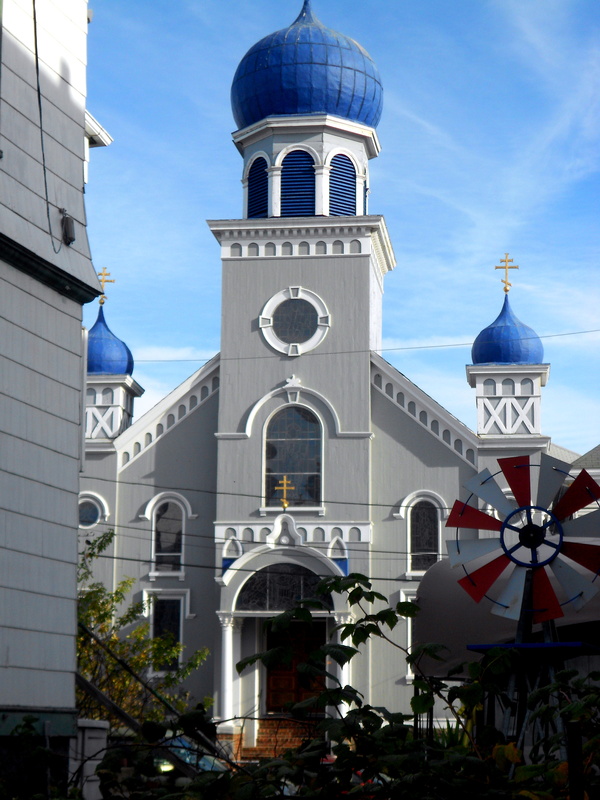 This is the St. Nicholas Russian Orthodox Church, built in 1908 for immigrants from Poland and Russia who came to work in the leather factories of Salem and Peabody. It’s on Forrester Street, off Salem Common, but I took this shot while examining a garden one street over–hence the whirligig. Black and orange are the predominant colors of the season but I was looking for pink this weekend. 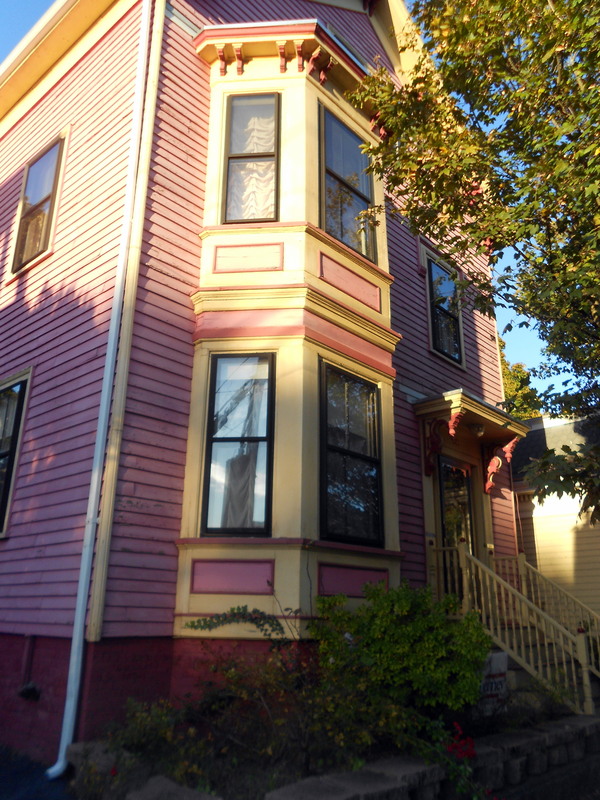 Pink houses, large and small, can be found all over Salem but primarily in the outlying neighborhoods away from the center historic districts. 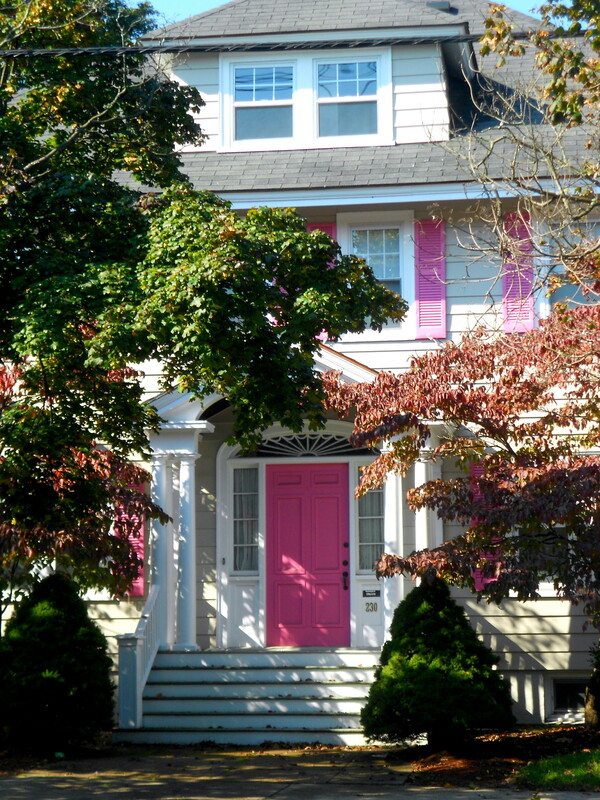 While colonial houses can look lovely in pink, this custom seems to apply more to Charleston and Savannah than it does to New England: pink is just not a Puritan color! 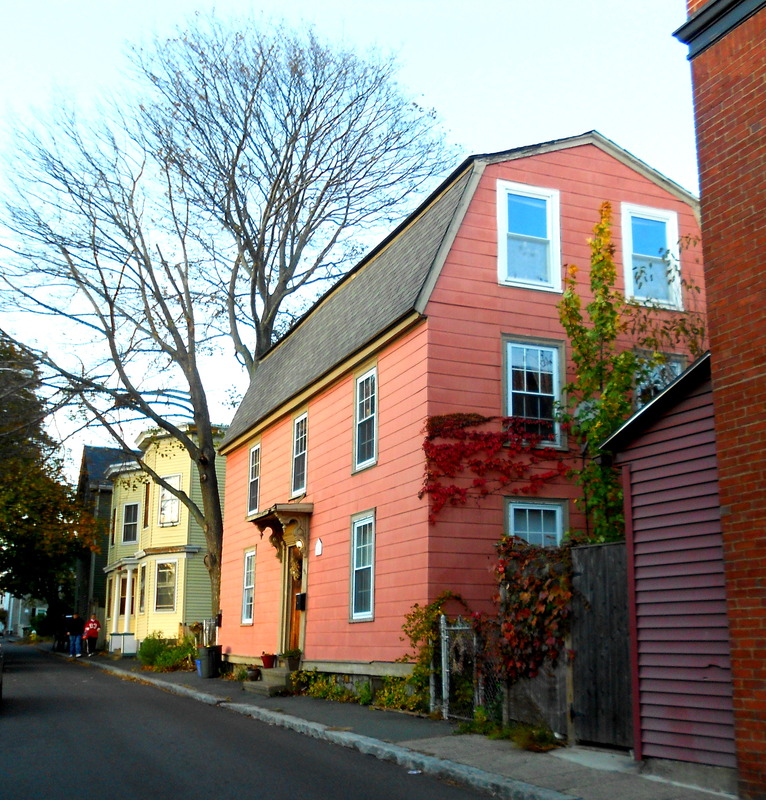 So most of Salem’s pink houses are Victorians, with the exception of a very bright Greek Revival on Winter Street just off the Common, and a little Georgian house in dusty salmon pink right off Derby Street. And on the other side of Derby Street, overlooking Derby Wharf, the Friendship, and the Custom House, a pink triple-decker, another iconic New England architectural style. I kept walking east: downtown was full of tourists and motorcycles, the weather was beautiful, and I knew that I’d find some pink house in the Willows. 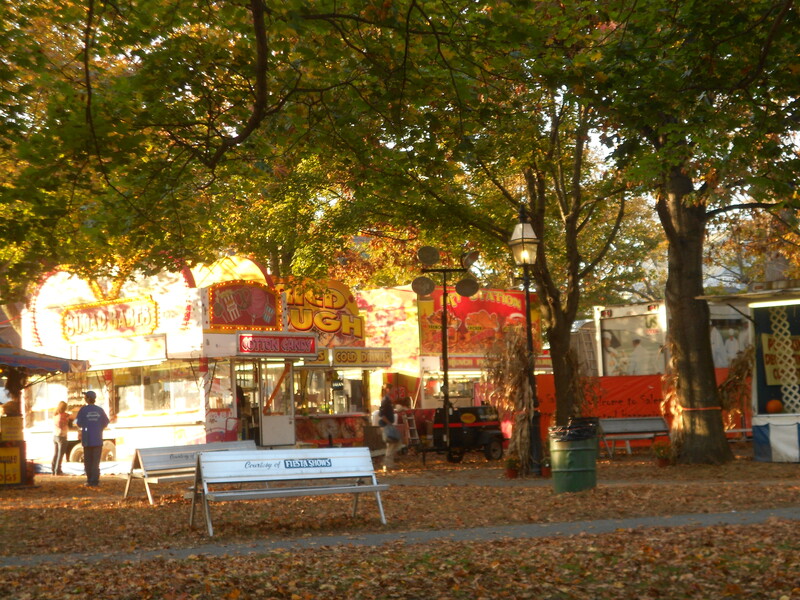 Salem Willows is a late Victorian park with an adjacent residential neighborhood of structures that were built as seasonal cottages in the later nineteenth and early twentieth centuries. 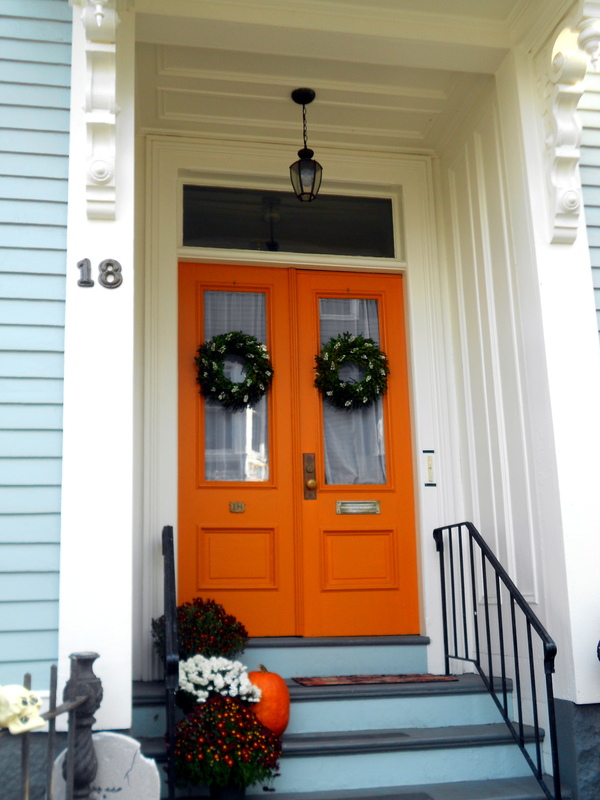 All of these houses have been transformed into year-round residences, and it’s a colorful neighborhood with few preservation encumbrances. 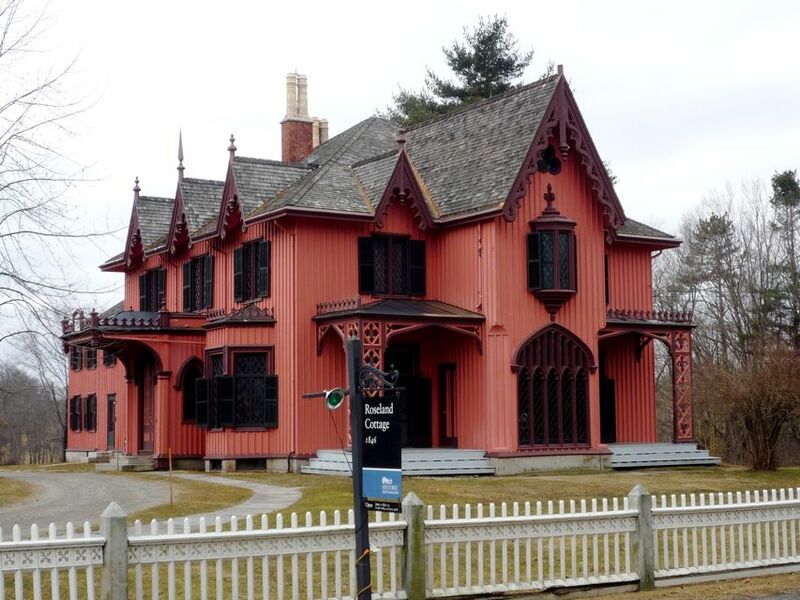 There was a full spectrum of pink here, from shocking Schiaparelli to the very pale color of the Gothic Revival cottage overlooking Juniper Point Beach. Back in town, I turned left and walked down Lafayette Street, which was a grand boulevard of painted ladies before the great Salem Fire of 1914. 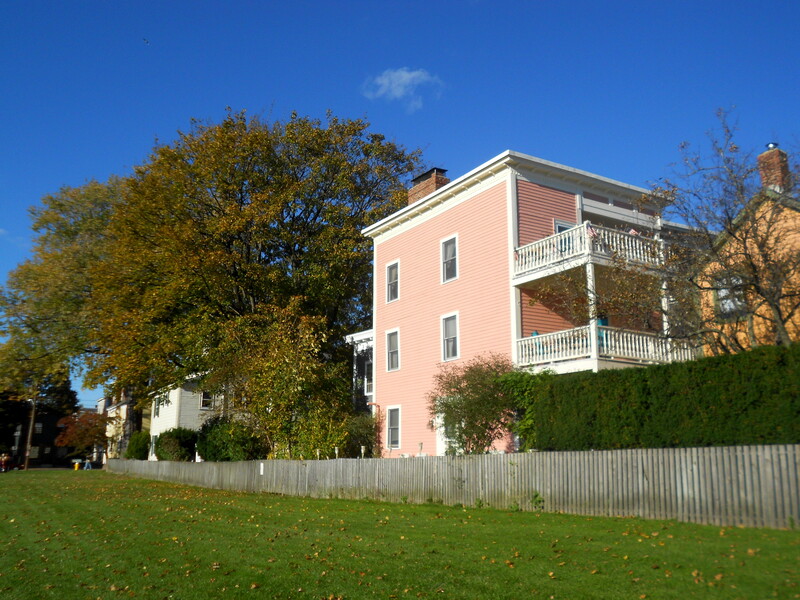 Some survived, and Colonial Revival residences replaced those that did not: one has a conspicuous pink and light gray color scheme that you cannot fail to notice. 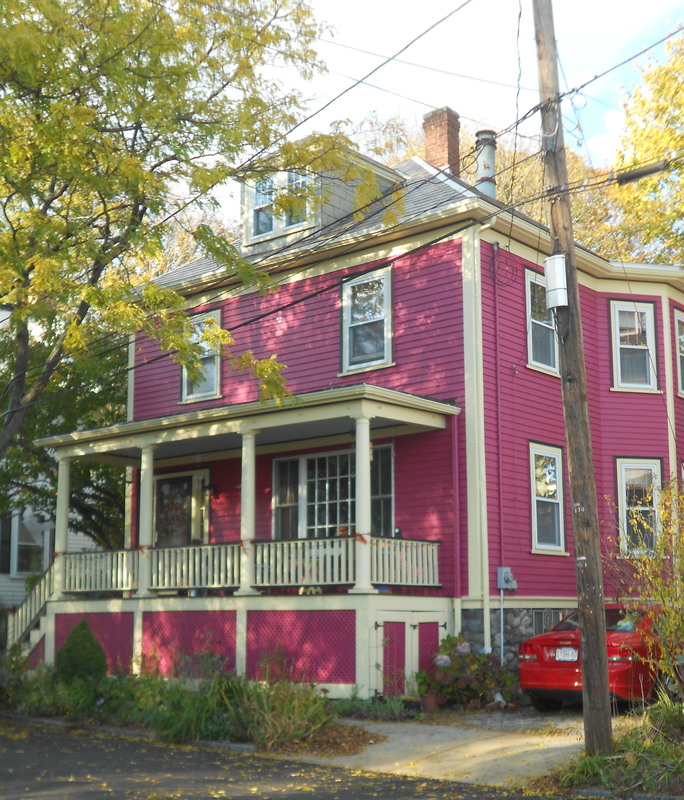 On a side street Lafayette, there’s a lovely late 19th century pink house, with an adjacent three-car garage, also in pink. 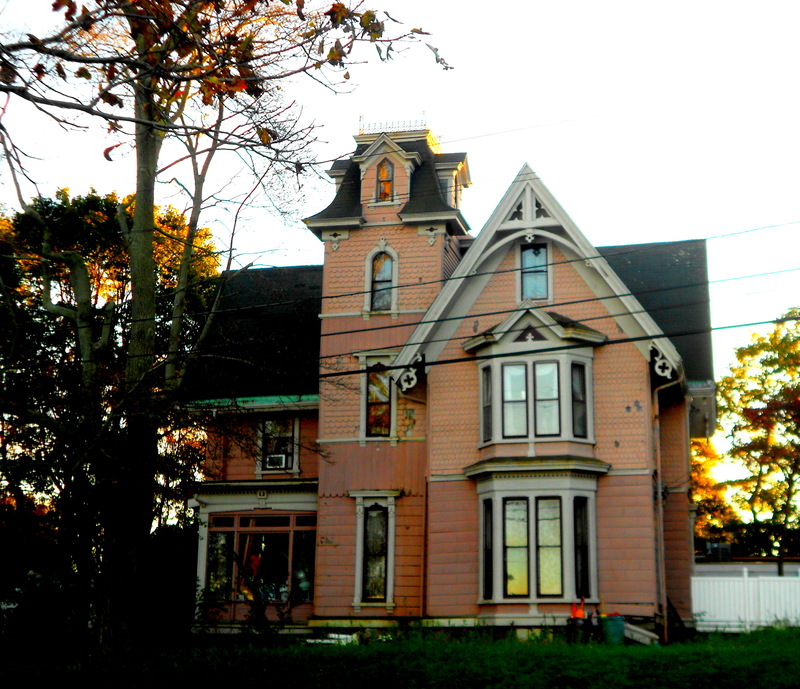 And way down the road, almost on the Marblehead line, is a “Scooby Doo” eclectic Victorian overlooking Salem Harbor dressed in faded pink. I was losing the light by this time, as you can see. 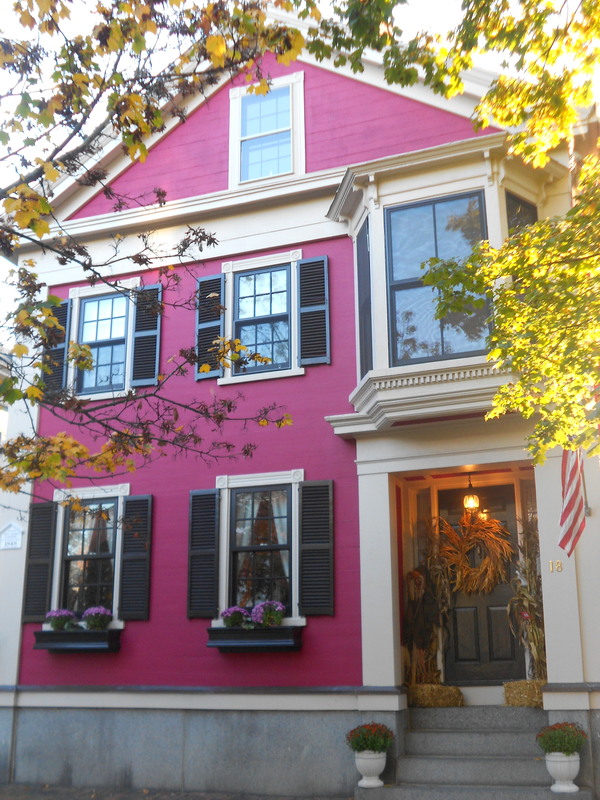 These are all great houses, but I must admit that my two favorite pink houses are not in Salem. 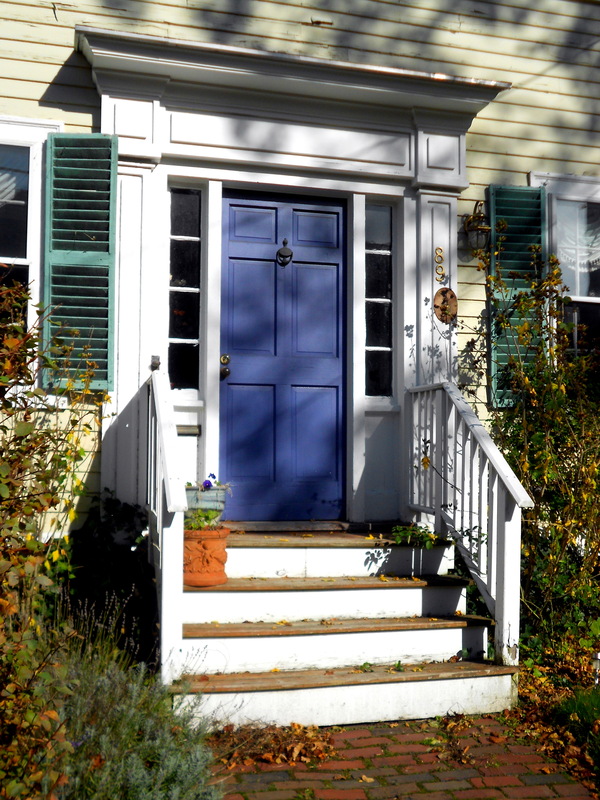 One is the Justin Morrill homestead in Strafford, Vermont, which I’ve already featured in a post, and the other is the Roseland Cottage in Woodstock, Connecticut, which is owned and operated by Historic New England. Both are assertively Gothic Revival structures–“Gothic” and pink are two descriptive terms which are seldom linked together, but in these two cases we have notable exceptions! Roseland Cottage, Woodstock, Connecticut, 1846. 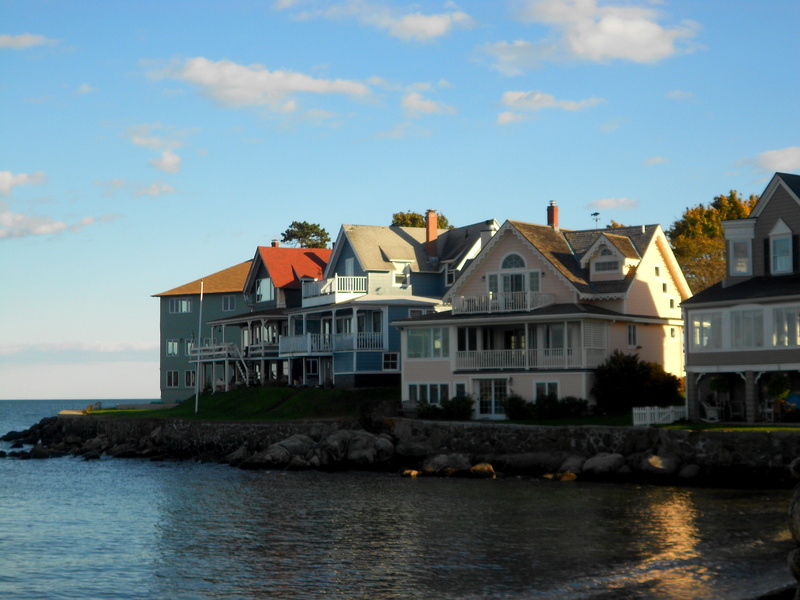 Historic New England. 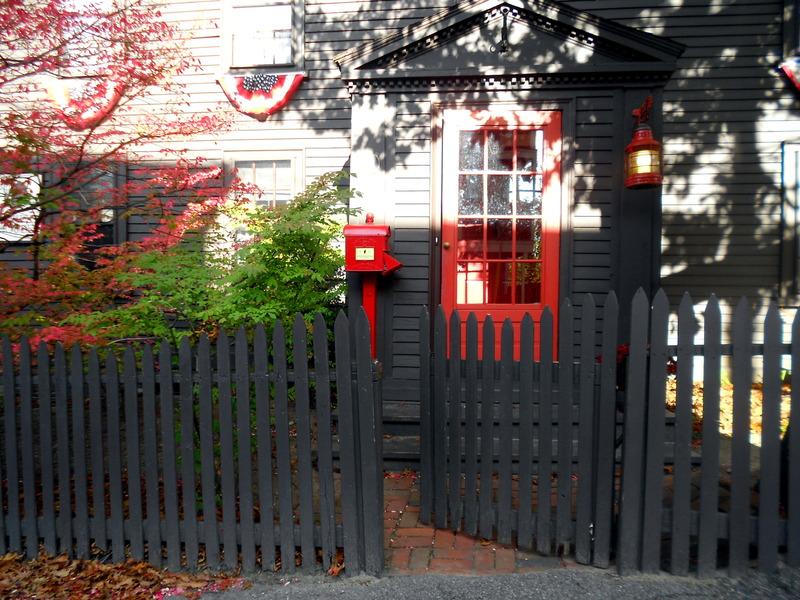 The iconic “Witch City” of Salem, Massachusetts evokes the spellbinding designs of New England’s rich history. 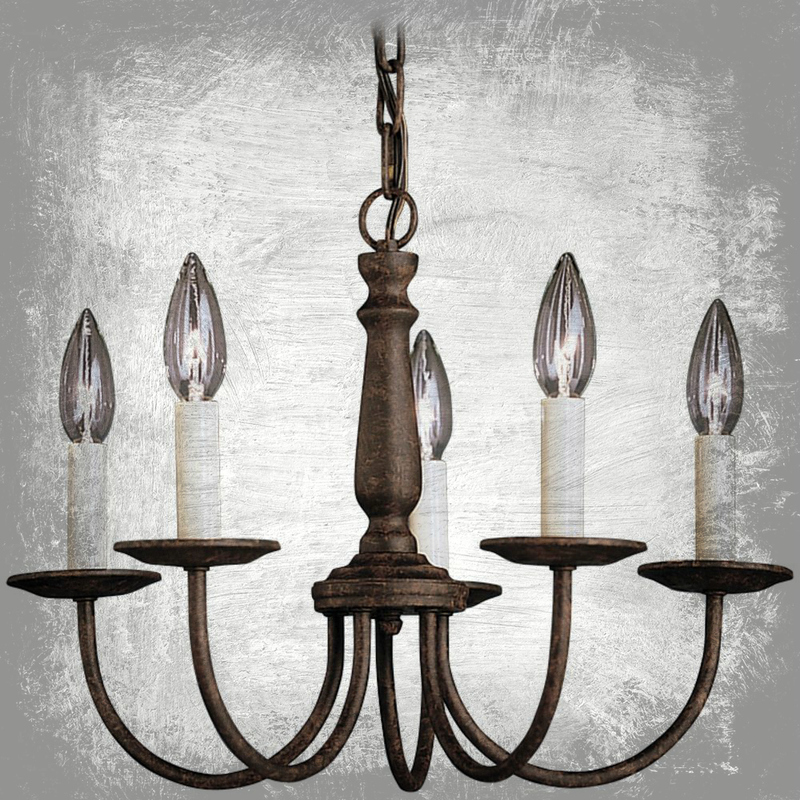 Transform your home into a stylish haunt with classic chandeliers and wingback chairs, experience the drama and dark grandeur of Nathaniel Hawthorne’s writings with handsome poster beds, conjure the infamous trials of 1692 with captivating prints and décor, welcome the spirit of commerce with captain’s quarters-worthy consoles, and illuminate All Hallow’s Eve with timeless lanterns and candleholders. 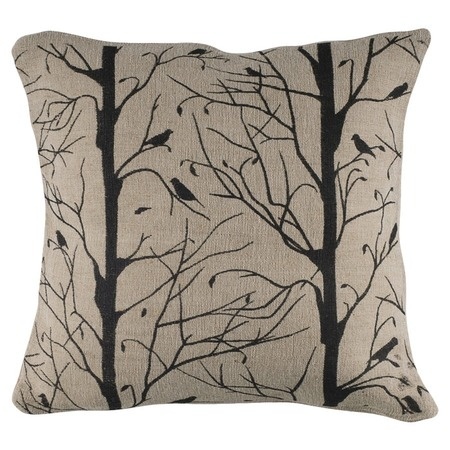 No Samuel McIntire-inspired goods, but it’s not all kitschy witchy either. 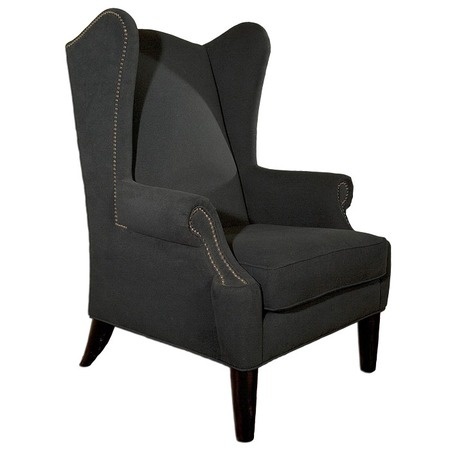 I’m pretty comfortable with a Salem that conjurs up the image of “dark grandeur” and the “spirit of commerce”. At this time of year, I’ve become resigned to the other stuff. 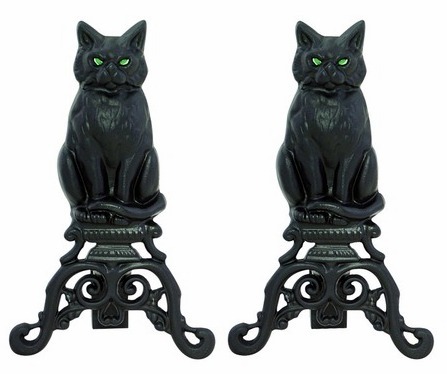 The actual goods seem to be evocative of a more colonial feel, and despite their overt Halloween appeal, I like the black cat andirons and was disappointed when they sold out. 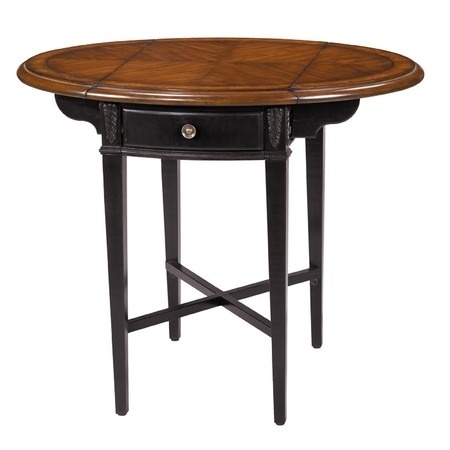 There are witchy prints, apothecary jars, cauldron planters, and ye olde Salem lanterns to complete the look, along with lots of Windsor-style furniture. 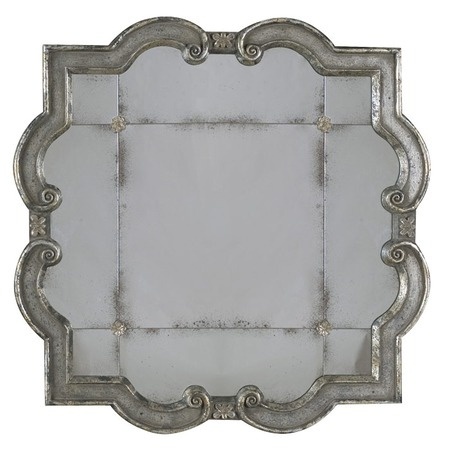 And then there were these two pieces, which confused and charmed me: I can’t quite figure out how the rather glam “Prisca mirror” fits into this scheme, except that it might be the “grandeur” in “dark grandeur”, and I was amazed to see that Salem’s own Nathaniel Bowditch (1773-1838), the eminent mathematician and acknowledged father of modern maritime navigation whose book The New American Practical Navigator (1802) is still carried on every U.S. naval vessel, has also inspired his very own “Bowditch drop-leaf table”. 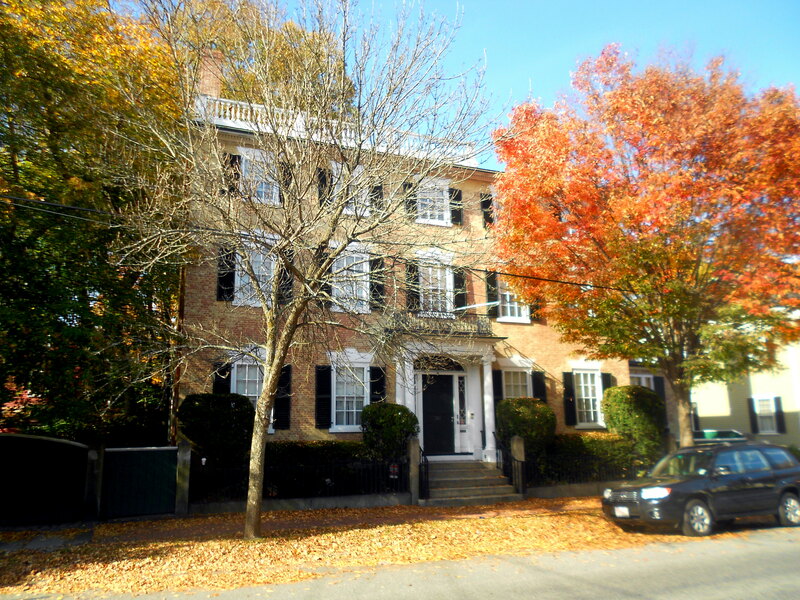 The other Salem Nathaniel, Nathaniel Hawthorne, has one too! I’ve been thinking about a short little article by BBC “History of the World” presenter Andrew Marr about the five most historical places in world history quite a bit since I came across it a few days ago. I love lists, I love history, understanding and developing a strong sense of place has always been important to me (it’s one of the major themes of this blog), and I teach world history: Marr has my rapt attention! 1. 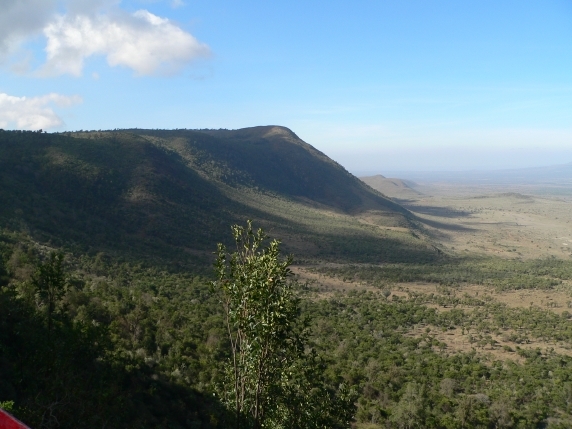 The Great Rift Valley in eastern Africa: where human civilization first emerged. A pretty predictable choice, and certainly one that is difficult to contest! 2. 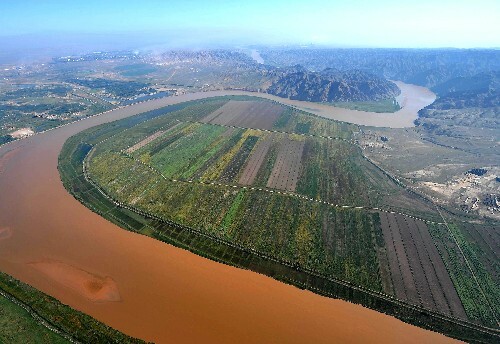 The Yellow River: China’s “mother river”, where its first civilization emerged. I’m not sure why Marr is privileging China above other world civilizations: he does not have Mesopotamia, the western “cradle of civilization” on his list. 3. 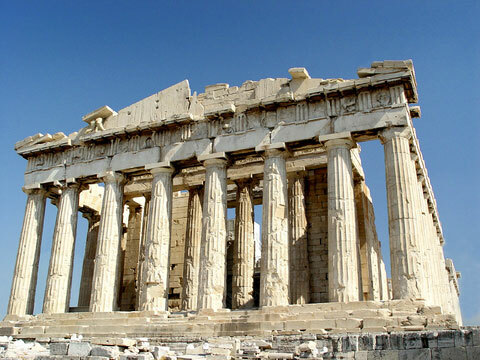 Athens, Greece: symbol of the Classical Age. I suppose this is Marr’s concession to ancient western civilization, and I think he feels sorry for present-day Greece. But it’s another obvious choice: rational philosophy, democracy, theater, architecture, the Olympics–I could go on. 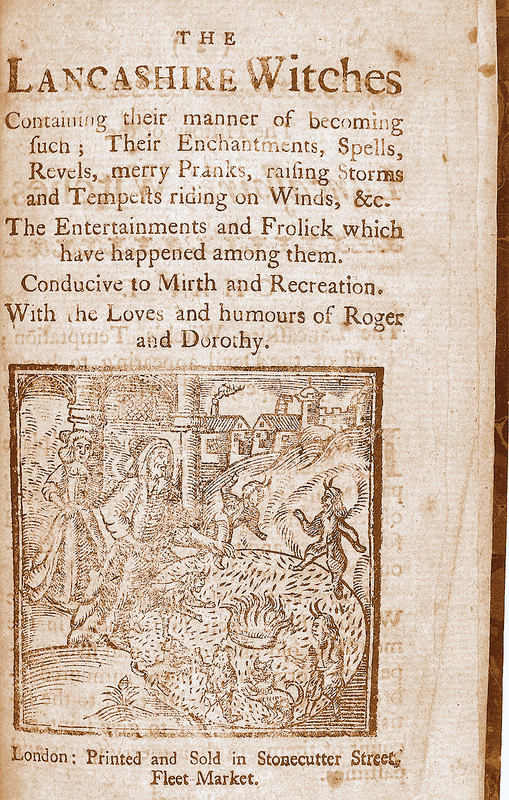 Ok, now we take a huge chronological jump: from the 5th century BC to the eighteenth century. 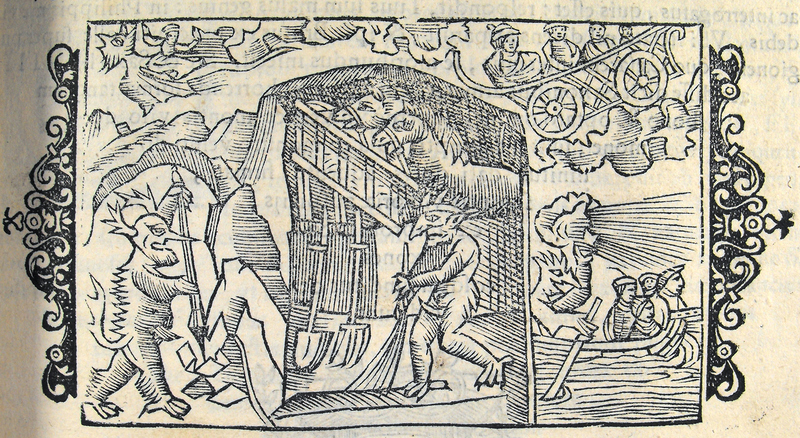 There is no amazingly significant place which has medieval (or as the world historians say, post-classical) relevance? 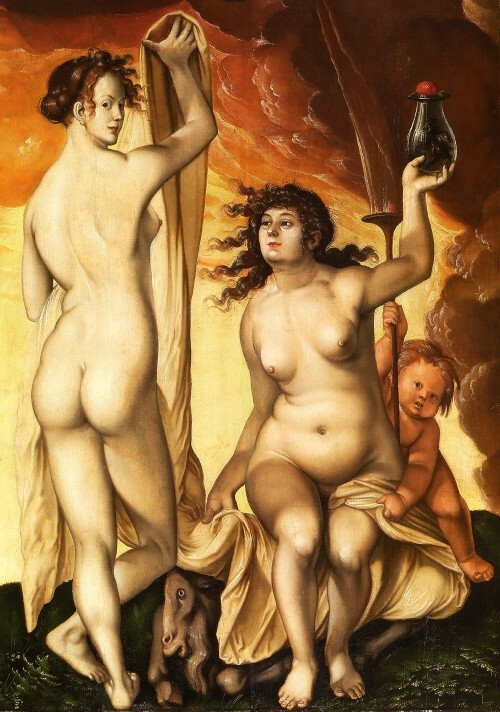 This seems like a very Renaissance view. 4. 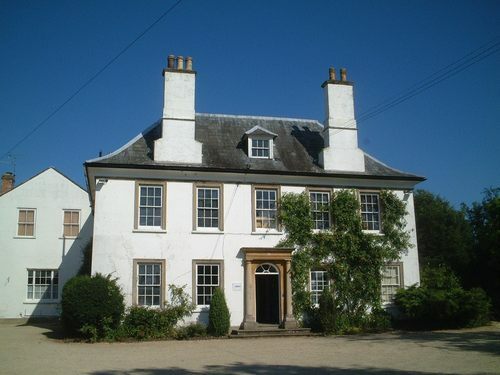 Berkeley, Gloucestershire, United Kingdom: the birthplace of Dr. Edward Jenner (1749-1823), who discovered the vaccination for smallpox. This is the only British place on the list (not London!) and Marr is a presenter for the BBC, so I thought it was a rather biased choice, but now I’m not so sure. Smallpox was a terrible disease, which killed millions of people in the New World and remained an endemic plague in the Old, and Jenner’s vaccination was an amazing empirical breakthrough. I think smallpox is the only disease in world history which has been completely eradicated, and that makes Jenner a towering figure both in the history of medicine and the history of civilization. Nevertheless, I think one of the five most important places in world history has to be more than the birthplace of just one person, however great he or she was. 5. 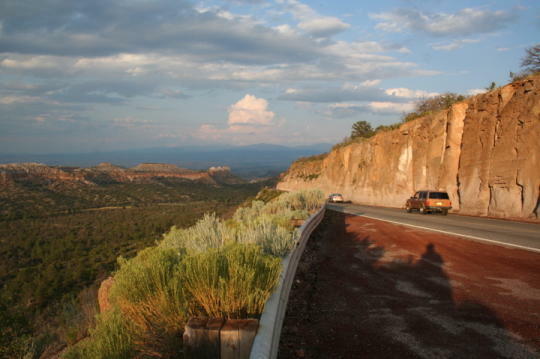 Los Alamos, New Mexico, United States of America: birthplace of the atomic bomb and the Atomic Age. A great choice: it’s sad that this is the American contribution to the list, but there you are. If you only have five places to choose of relevance in world history, you’ve got to go with the most consequential. This is a great list but I think there are a few places I would change. It’s so difficult to choose, because the list is short and the history is long–and complex. Obviously there are countless historical places; in fact, every place is historical. Choosing just five places is an exercise in frustration, but also one in prioritization, which is always useful. On my list, the Yellow River would be replaced by a city along the Silk Road that connected China and the Middle East and disseminated so many Chinese innovations, for better or for worse: textiles, gunpowder, printing, the compass. 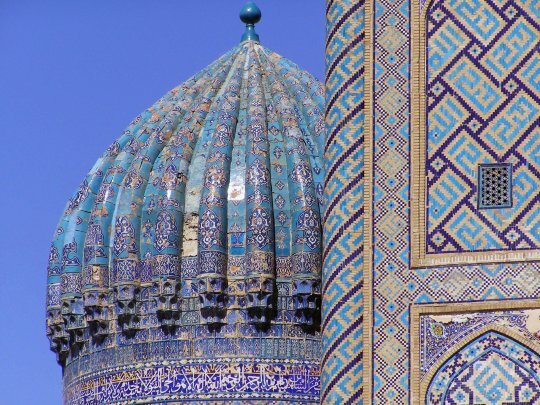 Maybe Samarkand or Bukhara, both currently in Uzbekistan, but symbolizing the West’s desire to obtain the knowledge and goods of the East. Samarkand, Uzbekistan: Silk Road “Port”. I considered Istanbul, Venice, and Rome, ports along the western African “slave coast”, and New York, but dismissed them all on relative criteria–basically my western bias. 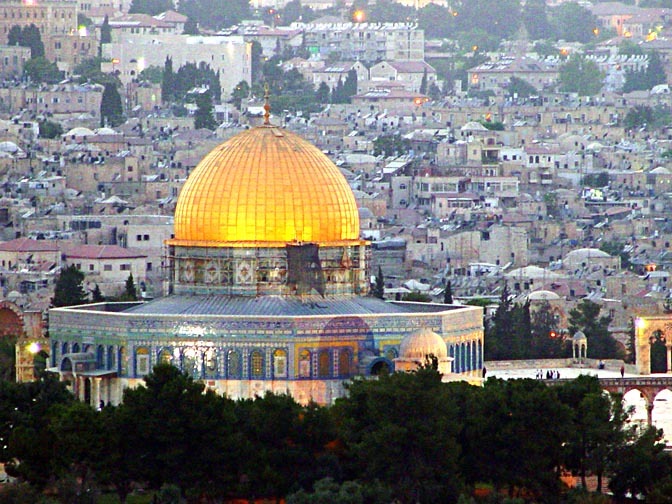 But I cannot dismiss Jerusalem, one of the oldest cities in the world and a holy place for three world religions. In my mind, there is no doubt that Jerusalem is one of the most important places in world history, so at least one of Marr’s places has got to go. What do you think?